6.4 When Does a Lead Bioavailability Study Make Sense? Prior to evaluating the bioavailability of lead in soils, soil lead concentrations should be compared to background levels. Bioavailability studies may help to evaluate health risks and establish remediation goals where lead concentrations are well above background levels. If lead concentrations in only some soil samples are comparable to background concentrations, and if the lead in those soils has not been characterized as site-related, then eliminating those samples from the bioavailability study might be considered. Soil lead concentrations and land use are interrelated factors in determining remediation goals and affect remediation priorities. Residential areas that are given highest priority for soil remediation are defined as any areas with high accessibility to sensitive populations, including family homes, apartment buildings, vacant lots in residential areas, schools, daycares, community centers, playgrounds, parks, greenways, and any other areas where children are at risk of exposure (USEPA 2003c). Other areas may be given lower priority and, with proper institutional controls, may be held to less stringent remedial goals. Soil lead concentrations and land use are also interrelated considerations when determining whether to perform a site-specific bioavailability study. Figure 6-3 provides general guidance on the potential usefulness of a lead bioavailability study, depending on lead concentration ranges and desired land use at a site. Note that this figure presents general trends and should not be construed as a prescriptive guide. Additional information about making site decisions to pursue site-specific bioavailability testing is included in the decision process chapter. Green boxes are soil lead concentrations that tend to fall within those limits in both USEPA and California DTSC models, indicating higher confidence that a site-specific bioavailability investigation might affect remedial decisions. Red boxes are soil lead concentrations that tend to fall outside those limits, indicating lower confidence. Yellow-shaded boxes are soil lead concentrations that approached only the more likely limits (orange) or that tend to fall with those limits in only one of the models (yellow), yielding intermediate confidence. Figure 6‑3. Likelihood of a Bioavailability Study Affecting Remediation Decisions at Lead-Contaminated Sites. The concentration ranges in Figure 6-3 are roughly based on lead exposure risk model estimates of preliminary remediation goals (PRGs) at the upper and lower limits of lead bioavailability. PRGs were estimated for residential and industrial/commercial land use scenarios using both USEPA and California DTSC lead risk models. 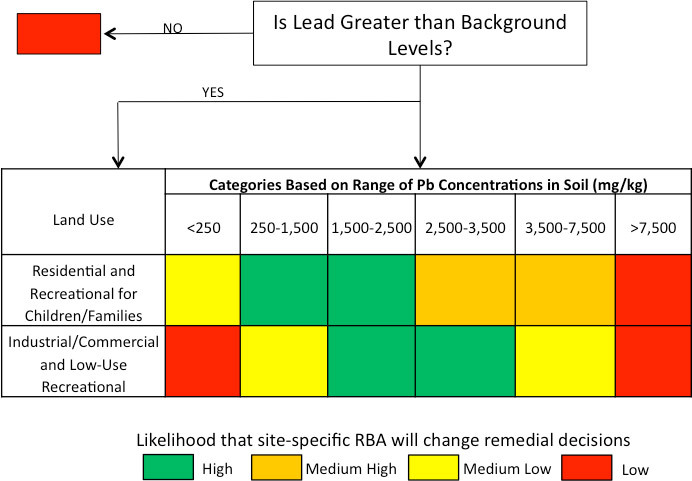 The upper and low limits of bioavailability of lead in soil at contaminated sites were assumed to be 1% and 90% RBA (Ruby et al. 1999) or, more likely, 14% to 88% RBA (USEPA 2016h). Future changes to the risk models may cause the concentration ranges in the figure to shift. At moderate lead concentrations, it is more likely that bioavailability testing will affect the outcome of remediation decisions for a site. The desired land use is also a factor because the land use dictates the acceptable levels of lead that may be left in soil while adequately protecting public health. Residential land use as defined by USEPA (2003c) includes apartment complexes, schools, daycare centers, playground, parts, green spaces; recreational land use includes walking trails, areas around lakes or ponds, or other areas children may frequent. Bioavailability values are used in lead exposure risk models developed by USEPA and other agencies, such as California DTSC, to predict BLLs in adults and children. Lead exposure risk models can be used to establish screening levels/PRGs specific to sites contaminated with lead. USEPA’s IEUBK model predicts lead exposure risks in children and is used to determine appropriate soil screening levels/PRGs for residential exposure scenarios. IEUBK default assumptions include a default RBA of 60%. USEPA’s ALM predicts lead exposure risks in adults (and fetuses of pregnant women) and is used to determine appropriate soil screening levels/PRGs in commercial and industrial settings. ALM default assumptions include a default absorption fraction of 0.12 (or RBA of 60%). Other regulatory agencies have established soil remedial action levels that are based on different lead exposure models with different assumptions or default parameter values. For example, California DTSC’s current soil screening levels of 80 mg/kg for the protection of children at residential sites and 320 mg/kg for commercial/industrial sites, where pregnant women are the most sensitive population subgroup, are based on the probability that blood lead increases above 1 µg/dL may occur in no more than 10% of exposed children and fetuses (California Environmental Protection Agency 2009). 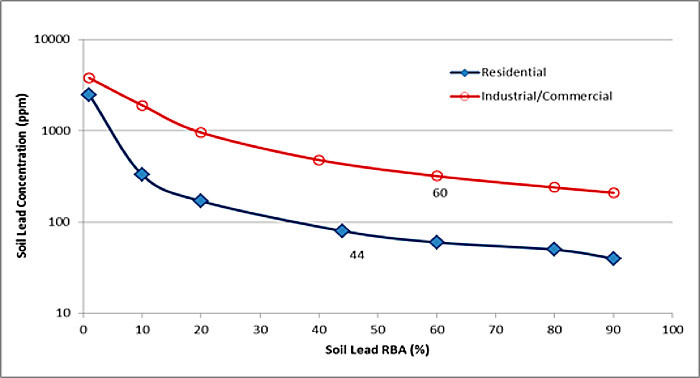 USEPA’s default RBA value of 60% for lead in soil and dust is a central tendency value considered by USEPA to be a “plausible default point estimate for the relative bioavailability of lead in soil compared to soluble lead when site-specific data are not available.” Because the default RBA for lead in soil is a central tendency value rather than an upper bound value, lead bioavailability at a site could be higher or lower than USEPA’s default value (USEPA 2007c). At sites with lead concentrations below default screening levels, lead exposure could pose unacceptable risk if site-specific bioavailability exceeds the default bioavailability values used in the lead risk models. At sites with lead concentrations exceeding default screening levels, exposure risks may fall within an acceptable risk range if site-specific bioavailability is below the default bioavailability value of a lead risk model. Bioavailability studies may become less useful at higher lead concentrations. At very high lead concentrations, soil remediation is likely to be warranted unless there are other limiting exposure factors. Assessing site-specific bioavailability may help to ensure that soil remediation priorities and remediation goals are sufficiently protective for different exposure scenarios. If future patterns of exposure at a site are uncertain, then assessing site-specific bioavailability may also ensure that soil remediation goals remain sufficiently protective. Figure 6-4 illustrates how soil screening/preliminary remediation goals might vary as bioavailability values change, based on California DTSC’s lead exposure criteria. This figure illustrates that even small changes in bioavailability can affect risk estimates and soil remedial action levels. The data shown are based on 90th percentile estimates of 1 µg/dL increase in BLL in children (residential scenario, blue line) and fetuses of adult workers (industrial or commercial scenario, red line), corresponding to a decrease of approximately 1 IQ point. Default RBA values are 44% (residential) and 60% (industrial or commercial). Soil remedial action levels were calculated using California DTSC’s Lead Risk Assessment Spreadsheet 8 and modified ALM (DTSC 2011a). Figure 6‑4. Effect of bioavailability on soil remedial goals using CalEPA’s lead assessment approach. Site-specific conditions that might warrant a bioavailability study for lead can include differences in lead form (mineral phase) and particle size as well as heterogeneity in soil physiochemical properties across a site—factors that could be sources of variability in an RBA. More soluble lead minerals are generally more bioavailable than less soluble minerals. Likewise, the bioavailability of lead would decrease with increasing particle size. For example, an RBA would be lower for soil with larger lead particles such as mine tailings or firing range debris relative to more weathered sources with finer particle sizes and greater surface area (USEPA 2003c). Common lead-bearing mineral phases in contaminated soils consist largely of primary minerals associated with ore materials, including lead-sulfide (galena), lead oxide, lead phosphate, lead-sulfate (anglesite) and lead-carbonate (cerussite) (ATSDR 2007b). Sites with lead tailings may contain more lead sulfide, while lead smelter sites may have more lead oxides. Sites are often complex, however, and may contain multiple lead species. Once ingested, lead compounds that may be sparingly soluble under environmental conditions (neutral pH) can become increasingly soluble as pH approaches or falls below 5 as it does in the human gut (ATSDR 2007b). USEPA (2007b) studied the relative bioavailability of several lead mineral phases and concluded that galena and anglesite were among the least bioavailable, whereas, cerussite was among the most bioavailable; see Figure 6-5 which presents RBA values for different lead mineral phases determined from a swine exposure study. The relative bioavailability of galena and anglesite are clearly less than USEPA’s default value (60%), while the bioavailability of cerussite is greater than the default RBA highlighting the importance of obtaining site-specific RBA estimates. Soil particle size may also significantly affect bioavailability. Dust particles may be more likely to stick to skin surface and to be inadvertently ingested. Dust particles may also be more bioavailable due to their greater surface area. Figure 6‑5. 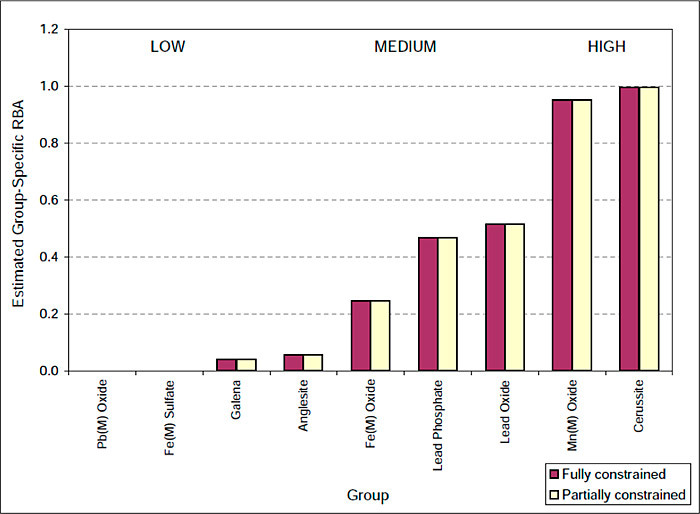 Relative bioavailability (RBA) estimates of several lead mineral phases reported by USEPA (2007b), Figure 2-7. The different bars represent different statistical approaches to estimating RBA.